A Certificate Authority (CA) is an implicitly trusted system that is responsible for issuing and managing digital certificates. A certificate created by a known authority can be authenticated as genuine. For more information about certificate authorities, and using certificates, see Managing Certificate Authorities. To create your own certificates for use in VPN tunnel authentication, requires access to at least one Certificate Authority. It is possible to purchase certificates from an externally managed Certificate Authority, but this can be inconvenient and costly. 1. Go to Network > VPN > Certificate authorities. • Life time — From the drop-down menu, select the length of time that the Certificate Authority is valid for. 3. Click Create Certificate Authority. Once a Certificate Authority has been created, you can use it to create digital certificates for network hosts. 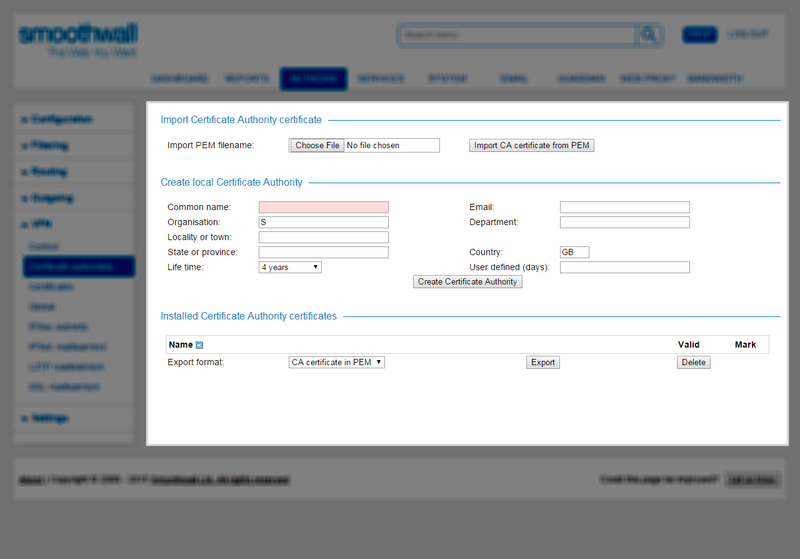 You can also export the Certificate Authority’s own certificate to other systems, which can use it to authenticate digital certificates issued by the Certificate Authority. If you already have a Certificate Authority on your network, it may be useful to use that. For a detailed description of how to do this, see Importing Another Certificate Authority's Certificate. Note: You can only create one Certificate Authority for VPN use. To create another, you must first delete the previously created Certificate Authority. For more a detailed description of how to do this, see Deleting the Local Certificate Authority and its Certificate. 2. From the Installed Certificate Authority certificates panel, Mark the relevant local Certificate Authority. • CA certificate in PEM — An ASCII (textual) certificate format commonly used by Microsoft operating systems. Select this format if the certificate is to be used on another Smoothwall System. • CA certificate in BIN — A binary certificate format. For more information about whether your systems require the certificate in this format, refer to the system’s documentation. 4. Click Export, and follow the instructions from your browser to save the certificate to another location. The certificate only contains public information, so can be used on other systems without any additional security requirements. To authenticate a signed certificate produced by a non-local Certificate Authority, you must import the non-local Certificate Authority’s certificate into the Smoothwall System. Typically, you do this on the secondary Smoothwall System so that they can authenticate certificates created by a master Smoothwall System’s Certificate Authority. Note: The certificate must be in PEM format to be imported. 2. From the Import Certificate Authority certificate panel, click Choose File. 3. Locate and open the Certificate Authority’s certificate that you wish to import. The certificate is listed in the Installed Certificate Authority certificates panel. 1. Go to Network > VPN > Authorities. 2. From the Installed Certificate Authority certificates panel, Mark the non-local Certificate Authority certificate. The Certificate Authority certificate no longer appears in the Installed Certificate Authority certificates panel, and the Smoothwall System cannot authenticate any certificates created by it. 2. From the Delete local Certificate Authority panel, select Confirm delete. 3. Click Delete Certificate Authority. Note: Deleting the local Certificate Authority will invalidate all certificates that it has created. Once the local Certificate Authority has been deleted, the Create local Certificate Authority panel appears. This change in layout occurs because a Certificate Authority no longer exists on the Smoothwall System. The Create local Certificate Authority panel replaces the Delete local Certificate Authority panel.